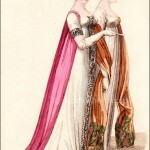 Fashions of London and Paris, January 1809. Though I love the dresses, especially the red one, I am not fond of the headdresses. The first looks like a modified mob cap, and the tie beneath the chin further suggests a morning cap. It does not suit the elegant dress. 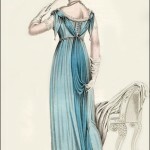 The scarf, or “veil” as it is described, on the second figure looks a bit Bohemian for evening wear. 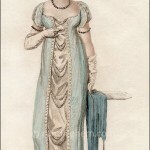 However, throughout the extended Regency period, especially before 1810 and after 1815, fashion prints showing evening wear often include some form of headdress, many of them fancier versions of the same style hats worn during daytime. Perhaps they wore evening headdresses, in this case, because it was January and they wanted to keep warm. Despite the headdresses, the dresses are lovely. “Fig. 1.–A short dress of very fine Indian muslin; the bosom formed entirely of lace; the sleeves, front, and bottom of the dress, slashed, with fine lace drawn through in puffs. A cap of white satin, trimmed with lace. White shoes and gloves.